. . . . . . . . . This year, Samson and festival director Jimmy Hunt (also of Boone’s Music on the Mountaintop festival) are adding a second outdoor stage and offering a beer-and-barbecue tasting that pairs brews from Pisgah and Craggie with Luella’s BBQ. What they want, say promoters, is a free, community-minded festival that boosts West Asheville’s profile and economy while promoting a wide range of up-and-coming, local artists not often heard at larger fests in the area. This year, the local artists include a preponderance of indie folk-rock acts, including For The Birds, 10 Cent Poetry, Uncle Mountain and Do it to Julia (Uncle Mountain and Do it to Julia played last year as well). Getting exposure at a festival like All Go West is perhaps most important to independent artists, Hunt says, because, as the music business has gone more online, unsigned bands increasingly rely on live shows to build a buzz. Jam bands and world music artists are well-represented at many local festivals; not so with most indie acts. “All over the map” describes Phillips’ supporting cast at All Go West, as well. The festival’s lineup encompasses genre-bending acts, reggae-ska, electronica, soulful songwriters, punk-thrash, funky hip-hop, Americana and more. Hunt acknowledges that closed streets full of vendors and festival crowds may be stressful for some of the West Asheville shops near the performance area — but he hopes the festival’s community focus will more than compensate for any inconvenience. — Nathaniel Axtell is an Asheville-based freelance writer. Find out more about All Go West Festival: Video Interview with Jeremiah Greer Live! 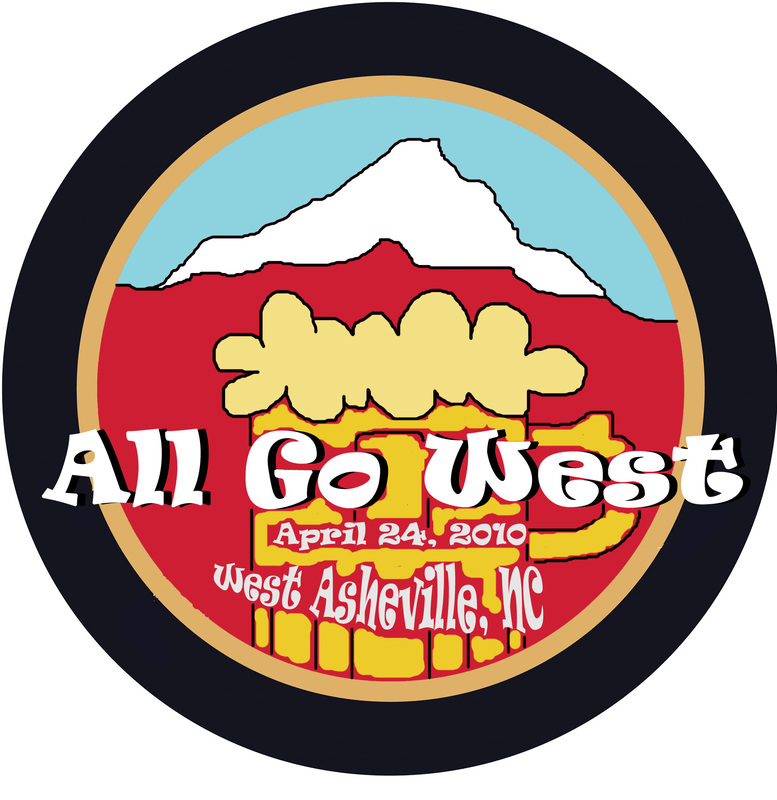 All Go West Music festival to take on its second installment, located in the streets west Asheville NC. On April 23rd, 2011, The Festival will uniquely offer an array of musical talent, BBQ, and local Brew. Free! In the second annual running of All Go West, anticipation builds for the integrating a great deal of local artistic talent to create a superior festival based upon community. The street party takes place on April 23rd, 2011 from 12 PM until 10 PM in west Asheville, in front of Harvest Records. All Go West is a festival embracing ideals of Asheville’s naturally creative progression, offering local art, food, beer vendors, and musicians. The festival’s admission remains free, hoping to enrich the cities ethos as an outstanding venue, gifted in a strong imaginative talent. This year, All Go West is excited to introduce the newest installment, Beer and BBQ Tasting, featuring Luella’s Barbeque. The 2011 Beer vendors include Pisgah Brewing, Highland Brewing Company, Foothills Brewery, Forty Back Brewery, and more TBA. The city of west Asheville has opened up the streets of Waynesville Road and Westwood Place to local vendors, fashion boutiques, and artists for the public to contribute their own artistic venture. The most significant feature to the festival is the broad range of musical talent to take over the Mountain Xpress and Pisgah Stage located on Waynesville Road. Spanning a vast range of different genres, All Go West incorporates everything from hip-hop, blue-grass, electronic, and even rock. The All Go West Music Festival in Asheville on April 23rd, 2011 ~ Free ~ Music, Fashion, BBQ & Local Brew ~ Josh Phillips Folk Festival, Floating Action & more! All Go West Music festival to take on its Second installment, located in the streets west Asheville NC. On April 23rd, 2011, The Festival will uniquely offer an array of musical talent, fashion, BBQ, and local Brew. Festival Remains Free To Patrons. Asheville, NC – In the second annual running of All Go West, anticipation builds for the integrating a great deal of local artistic talent to create a superior festival based upon community. The street party takes place on April 23rd, 2011 from 12 PM until 10 PM in west Asheville, in front of Harvest Records. All Go West is a festival embracing ideals of Asheville’s naturally creative progression, offering local art, fashion, food, beer vendors, and musicians. The festival’s admission remains free, hoping to enrich the cities ethos as an outstanding venue, gifted in a strong imaginative talent. This year, All Go West is excited to introduce the newest installment, Beer and BBQ Tasting, featuring Luella’s Barbecue. The city of west Asheville has opened up the streets of Waynesville Road and Westwood Place to local vendors, fashion boutiques, and artists for the public to contribute their own artistic venture. The most significant feature to the festival is the broad range of musical talent to take over the Pisgah Stage located on Waynesville Road. Spanning a vast range of different genres, All Goes West incorporates everything from hip-hop, blue-grass, electronic, and even rock. So excited about All Go West tomorrow 4-24 in West Asheville! WEST ASHEVILLE – Long gone are the days when West Asheville was written off by residents as “Worst Asheville.” That frontier off Haywood Road has been settled by artists and entrepreneurs, hipsters and hippies. This transformation into a bustling creative neighborhood is what the All Go West festival is celebrating from noon-10 p.m. Saturday. Performers include Stephaniesid, Do It To Julia, Brushfire Stankgrass, The If You Wannas and Yo Mama’s Big Fat Booty Band. Thanks Michael for the compliment on the website, “very cool and well-designed website”; we appreciate it! Also a big Thank You to Ashvegas Jason Sandford for his posts abut ALL Go West: here, here, and here. Also thanks to all the tweeters, facebookers, bands, sponsors and other people that are helping to make this event a success! It’s a vacuum that comes and goes. West Asheville has been home to a number of music and arts street parties, such as the now-defunct West Fest, a short-lived turn with Fiesta Latina, and holidays-related gallery and boutique crawls. But Hunt — who started Music on the Mountaintop, an ecologically minded large-scale music festival in Boone three years ago — felt like what his new neighborhood needed was a local festival to call its own. It was at Music on the Mountaintop that Hunt, who manages indie-rock band Do It To Julia, met Arieh Samson, who manages Yo Mama’s Big Fat Booty Band. Samson had been considering producing a funk festival in downtown Asheville; when he and Hunt brainstormed, All Go West Festival (to be held in West Asheville behind the Rocket Club and in front of Harvest Records) was born. The result, for the inaugural year, is a collection of interactive nonprofit booths (plus, a portion of the proceeds from All Go West benefits the Dogwood Alliance), a Kidz Zone, food and a group of about 15 local artists, as well as music happening on two stages. The culmination of playlists and fantasy rosters resulted in the Booty Band and Do It To Julia, of course, but also pop group stephaniesid, steel-pan fusion act Jonathan Scales Fourchestra, eclectic newgrass/rock outfit Brushfire Stankgrass, live-electronica bands RBTS WIN and Marley Carroll & The Melanaster Band, folk duo Underhill Rose, jazz/rock project The Archrivals, indie-folk groups Kovacs & The Polar Bear and Uncle Mountain, jazz-jam act Vertigo Jazz Project, indie-rockers If You Wannas, Voodoo Wedding and Open Windows, and Americana group Tennessee Jed Band. “We wanted to touch on every type of music that’s represented in Asheville,” Hunt says. Some genres (say, classical and world beat) aren’t on the list, but indie rock — often neglected at festivals in favor of crowd-pleasing funk and jam — makes its presence known. “One of our goals with this festival was to touch on the emerging music. There’s a new indie folk-rock scene coming out of Asheville right now,” Hunt points out. All Go West Festival is April 24th in West Asheville! Free!